Now that the Sad Puppies have failed in their strategy to take over the Hugos by manipulating the nomination process, I thought I could safely ignore the rest of their sci fi and fantasy backlash. But the Wired article I’ve been discussing for several posts tells me I’m wrong. It took some of the terms coined by Sad Puppies and used them with a straight face. Other mass media outlets have done the same. Only one problem with that: I can’t find any evidence that more than one person ever made that claim. So the accusation of which Patrick Richardson was complaining came in a private email from one person to another. Next up was a post by blogger Mike Glyer saying with the ultimate message that (1) if you try to attach yourself to fandom, you are a fan; and (2) you don’t need anyone’s permission to be there. The post, “Why You’re Not a Fan” began ironically, however, with a silly list of qualifications you must hold to be a fan. You have to read fanzines, join a club, own Star Wars action figures, join a Bardic Circle, AND do cosplay. That’s “trufan” in a nutshell: a tempest in a teapot. Next up, CHORF. The etymology is simple. Puppy leader Brad Torgersen coined it in March 2015 to mean “Cliquish, Holier-than-thou, Obnoxious, Reactionary, Fanatics.” It was first used to refer to Teresa Nielsen Hayden, after an argument in the comment thread of “Distant Thunder, and the Smell of Ozone.” It is now broadly applied to a larger group of people. “Social Justice Warrior,” like “CHORF,” is used broadly. The term has been around since at least 2009, when the Will Shetterley began the blog Social Justice Warriors: Do Not Engage. It’s also been used (very rarely) by activists to refer to themselves. But in 2014, Gamergate happened. That was a backlash against female video game programmers and players. It appears to have been orchestrated by a small number of Twitter users, who also strategically planned the use of hashtags such as #notyourshield. The term “Social Justice Warrior” and its shorthand “SJW” was officially intended to apply to the worst form of Internet troll, but in actual usage it applied broadly to anybody who disagreed with Gamergaters. This meant that Gamergaters could imply somebody was a troll without actually saying so. Also, naming somebody as a warrior provided a pretext for attacking them. In 2015, the term it made its way into the science fiction and fantasy blogosphere. Here are a couple of examples. For the last several years, a vocal minority of Social Justice Warriors has wrecked havoc on the fabric of the science fiction community. Taking their clues from the Alinskyite “direct action” tactics of far-left political activists, they’ve carried out a virulent campaign against anyone unwilling to toe the political correct line on victimhood identity politics. The issue with the Social Justice Warrior contingent isn’t just that they’ve got their causes, it is that they take those causes and use them to brow beat not only their opposition, but also the innocent bystanders, the undecided, and newcomers. But from the start, Correia had some serious complaints. He felt that the Hugos had become overly dominated by what he and others call “Social Justice Warriors,” who value politics over plot development. It was lazy journalism to use the term without trying to provide an actual definition. I get why it happened, though: there isn’t a definition. Social justice warriors are [who?] who do [what?] That question can’t be answered. When faced with words like these, it helps to have a critical eye and a handle on what’s being implied and what’s being hidden. It’s worth the time to look for more accurate replacements and advocate for their use. 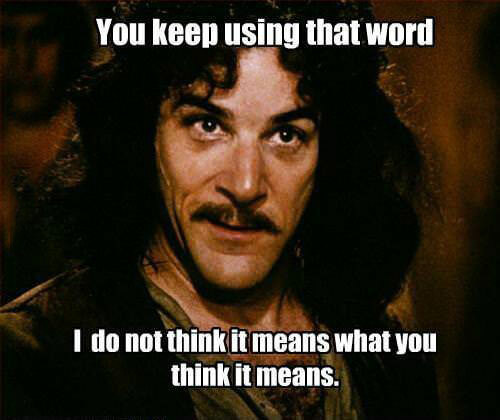 For example, “Social Justice Warriors” means “left-leaning Internet troll” in some cases and “feminist” in others. And finally, hold the mass media accountable. Words have power. Use them with care. This entry was posted in books, movies, tv, music, dreaming politics and tagged journalism, SFF backlash. Bookmark the permalink.